Martial arts can seem overwhelming from the outside looking in. There are so many movements -- so many approaches. But think of your body. There are really only so many ways it can move. The leg extends only until it is straight and no more. Your waist twists only so far. Even the mighty shoulder stops short while you are doing the wave at football games this fall. When it comes to movement, in a sense, you're in a box. 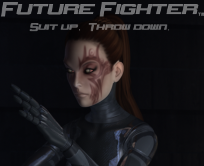 Despare not, future fighters, for there is a principle of fighting that unlocks the body's options, and we look at all the notches and teeth in this week's Pummel Podcast. Download the video to see how this is being applied to the characters in Future Fighter, follow me to learn how this principle is used to help you control your fighters in game, and use the buttons below to share this post with your friends because sometimes it's good to be square. TELL ME WHAT YOU THINK ABOUT "Square"